As teachers, we want our students invested in their learning just as much as we are invested in their success. Odysseyware® is excited to add another layer of whole learner support through the inclusion of the Learner Dashboard – designed to invite student agency and accountability for learning! In addition to the Educator Dashboard, the Learner Dashboard is another example of how Odysseyware embraces the philosophy of the whole learner, through its suite of solutions that include Odysseyware online learning courses, ClassPace™ Blended Learning, BASE Education for Social Emotional Learning, targeted Individualized learning Plans aligned to NWEA™ MAP® Growth® assessment results and other tools and resources offered as part of our Well-Rounded Curriculum. So many of the characteristics that we often correlate with student success (not just grades on high stakes tests) stem from us creating more student-centered classrooms (especially in blended learning) and around the idea of student responsibility for learning. As we know, student-centered classrooms and student accountability don’t dismiss or negate or downplay the role of the teacher, but rather empower both the teacher and student to have the information they need to make choices for next steps. Ultimately, these approaches establish a more productive learning environment, supporting the teacher and student in building a positive relationship, and the student recognizes they have a “voice” in the classroom. Additionally, student accountability and self-monitoring contribute to learned responsibility, time and self-management, improved focus and time on task and organizational skills, while addressing the whole learner perspective with teachers helping their students become responsible for their own learning in school and in life. Academic self-monitoring can increase on-task behavior. Directing students with significant levels of classroom inattention to self-monitor their academic productivity is at least as effective in improving their focus as having them track their rate of on-task behavior. And measuring the amount of work completed has the added benefit of boosting student academic output (Maag, Reid & DiGangi, 1993). 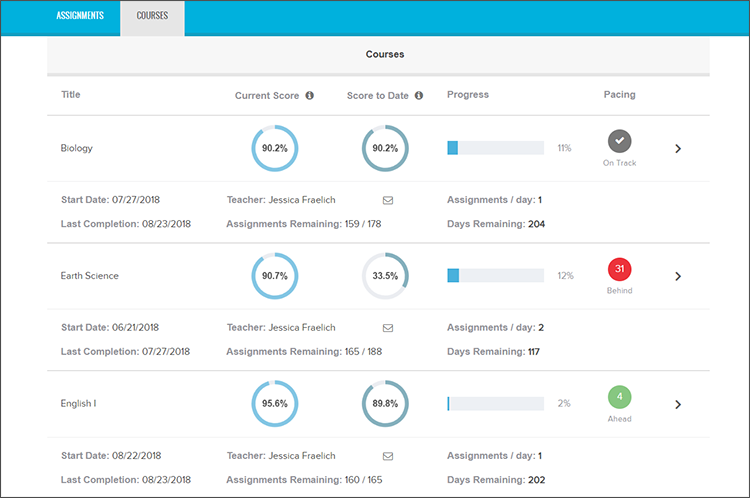 The Learner Dashboard acts as the courses landing page and was designed with students in mind, giving them the ability to monitor their scores, progress, and pacing. The Learner Dashboard is intuitive, easy to use, and allows students to understand quickly and easily what they need to get done in their courses. It acts as a digital planner and promotes responsibility, active engagement and active learning, while simultaneously providing students insight into what they know while encouraging the use of organizational strategies. Students also have access to key data points, giving them insight into their course score. Current Score: The current score students have earned on all assignments they’ve turned in and that have been graded, if manual grading was required. It’s their earned score for all completed and graded assignments. Score to Date: A more comprehensive view of the student’s course score. The system awards zeros for overdue assignments students have and factors those into their current score. It’s the students earned score for all completed, graded, and overdue assignments. Note: The Current Score and Score to Date data is the same information that can be found on the educator dashboard, providing consistency between what teachers and students see. Progress: Shows how much of their course(s) they’ve completed. Pacing: Allows students to see if they’re working ahead, on track, or behind. 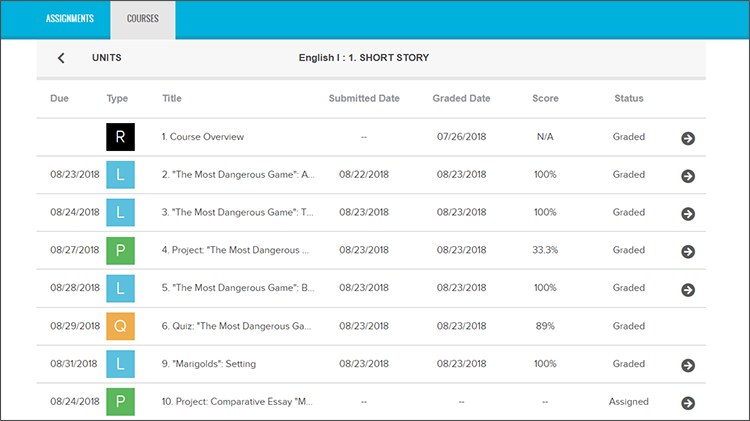 If students are behind, they’ll be able to see how many assignments they need to complete in order to get back on track and complete the course on time. If a student has questions or concerns over something they see on their dashboard, the teacher of record can be messaged directly from the Learner Dashboard; promoting easy, open, and frequent communication. For a more in-depth view of the course, students can click the arrow by the course to dig in deeper. This will allow students to see the course broken down by units, along with the unit’s current score, progress, and start date. Clicking the arrow beside a particular unit will show the student all assignments within that unit. They can then monitor submission date, graded date, score of the assignment, and status of the assignment. Students can also click on the arrow next to a graded assignment they wish to review. Watch the Learner Dashboard Tutorial! Watch the Odysseyware Learner Dashboard Tutorial video, and see for yourself just how powerful this new addition will be for student responsibility! The Learner Dashboard is one more layer to demonstrate Odysseyware’s commitment to supporting the whole learner. Engage with an Odysseyware expert today to learn more about our suite of solutions and how we can support your student-centered, blended learning, online learning, and social-emotional learning initiatives in your school and classrooms.